Today we are excited to announce the launch of tags! Tags provide another way to organize your notes beyond libraries & notebooks. They are super helpful for bringing together notes across notebooks that relate to the same project. So you could, for example, consolidate notes across Product, Marketing, and Sales notebooks with a single #project-gemini tag. They are also great for marking specific notes for quicker retrieval. You could, say, create a #to-read tag to remind yourself of clips and content you want to remember to read. Tags are even great for providing status or call-to-actions to your team. 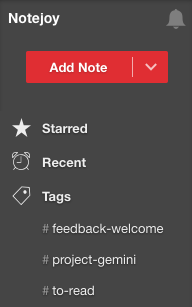 Say a #feedback-welcome tag when you are looking for feedback from your team. To add a tag to a note, simply type a hash following by your tag name (ex: #project-gemini) in the note title or anywhere in the note body. You can include as many tags as you like in either or both locations. You can use any non-space character in your tag name, including dashes, periods, slashes, and more. Notejoy ignores tags that are just numbers (#1, #12, etc) since it's unlikely the intent is to add a tag. Notejoy also ignores any tags inside of code blocks. And if you ever want to ignore tags in a note entirely, just add #ignoretags anywhere in the note. Once you've added a tag, the tag will show up in the tags section in the sidebar. You'll be able to click on a tag in the sidebar to quickly search for all notes that have that tag. Tags will be displayed alphabetically in the sidebar and will be shown lower case regardless of how you type them in your note. Notejoy will show up to 250 tags in the sidebar. Notejoy will also remember if you last left the tag list in the sidebar expanded or collapsed and always return you to your preferred state. You can also search directly for your tag (ex: #tag) to quickly get back to all notes with the tag. Or refine your search even further by including keywords alongside your tag to find notes with both your tag and search terms. Tags are seen by anyone who has access to the note containing the tag. So if you add tags to a note in a team library, everyone in the team library will see the tag show up in their tags list in the sidebar and be able to see all tagged notes they have access to. If you use tags just in your personal libraries, those tags will only ever be visible to you. The tags section will show up in the sidebar as soon as you add your first tag. So get tagging!